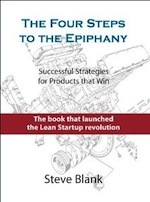 – My free online Lean LaunchPad class is here. – I also share all my syllabi, student presentations and my class lectures slides as well. What Makes a Wise Entrepreneur? Is Entrepreneurship a Young Persons Game? Unbelievable value – a very generous – giving person you are. Thanks. I appreciate the great information, but this page is nearly unusable for me — it brings my browser (up-to-date Firefox) to its knees for about 15 minutes, and greatly slows down UI responsiveness for the machine as a whole during that time period. (I have an iMac that is only six months old and has 4GB of memory.) Safari seems to have just as much trouble with this page. Please, please, please REMOVE the overwhelming multitude of embedded videos from this page that are actually loading and cuing videos to play. The embedded YouTube videos are perfectly fine because YouTube makes embedding smart and easy, and their method of embedding is light in its resource demands. However, the additional videos that you have embedded from other hosting platforms like Videopress and Vimeo are resource hogs, and they are causing this page either to take MINUTES to load or to cause the browser (Firefox, Chrome, others) to crash in memory. Instead, please provide links to these videos that launch in a new page or in unique viewer. Alternatively, you could also use a plugin to create a video gallery or unique player in WordPress. The previous, recommended solution (link to video and open in new page or window), though, is easier and quicker to implement. Just because a new Macbook or PC with 6, 8, 12GB of RAM and its i5, i7 CPU can handle the demands of the massive data on this page does not mean that lesser endowed Macbooks, laptops, iPads, Android tablets, iPhones or Android phones can. Without adding the NoScript plugin to the Firefox browser and interrupting the loading of the page, the incredible resource demands of all of these embedded videos causes Firefox to crash in memory over and over and over again. The Chrome browser has a similar experience, regardless of the device (laptop, tablet or smartphone). The net effect of the huge amount of data and its requisite memory and processor demands is that the access to your content has been put behind an exclusive wall for an elite minority of users with the requisite higher end devices and that your much wider audience for this content has been effectively blocked from accessing it. What is the point of sharing knowledge to a gated community? We very much want to hear what you have to say and learn what you have to teach, but the chosen method of sharing it on this page has effectively made that desired goal nearly impossible. Please hear this sincere request for change and act to make it a reality. If you need my help, you have my email address. Please feel free to contact me. We’re going to make fixing this a project for the next month. 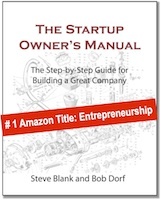 Hi steve, your HBR paper was great and recently I stumbled upon your MOOC at udacity on ” how to build a startup”. Abour 90 MBA students are taking this MOOC at Alliance University, Bangalore, India which is presently midway. There is a request from here. Can you come on a live skype session with these youngsters from Bangalore India, talk to them and clear their doubts at a convenient time in the next two weeks ? 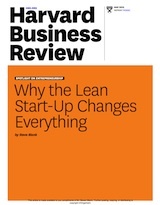 It will def give a great thrust for the lean startup ecosystem in India. Thank you, Mr. Blank, for all the good you bring to the startup community. We will NEVER be able to adequately express the depth of our appreciation.